SaraJean Matthews - "Changing My Life Around" - TRA-Brockton Success Story | Training Resources of America, Inc.
SaraJean Matthews has had to overcome many challenges in her life. At age 14 she was a troubled kid, hanging around with the wrong people, and constantly getting arrested by local police. Her life was headed in a bad direction. Then SaraJean enrolled in the Career Exploration Program operated by Training Resources of America (TRA) at the Goddard School in Brockton. Through the program, she began an internship as a Youth Development Counselor at the Boys & Girls Club, assisting in the Art Room, providing Gym-Recreational Activities, and supervising children in the After-School Homework Lab. SaraJean also served as a six-week summer intern, providing leadership, supervision, and fun-filled summer activities for the children including field trips, ice cream socials, basketball, summer kick-off events, and a back-to-school event. Now a 17 year old Goddard School sophomore, SaraJean continues to have a terrific impact on children and staff at the Boys & Girls Club. She is using the Career Exploration Program as an opportunity to get her life back on track, assuming responsibilities, learning good social, leadership and work skills, and becoming a role model for many children at the Club. 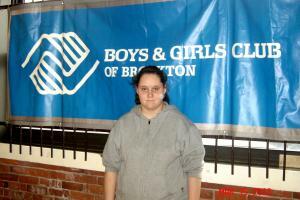 SaraJean says TRA, through the internship at the Boys & Girls Club, has given her a chance to “change my life around”. Her future goals are to help troubled children and eventually become a police officer. Congratulations, SaraJean – you are well on your way!